In biology crypsis describes an animal’s ability to avoid being perceived by other animals. Although it mainly involves visual camouflage through color, form, and movement, it can also comprise olfactory and auditory concealment. It can be either an anti-predator adaptation or a predatory strategy. The word “crypsis” has the same origin as “encryption”: the Greek word kryptos, meaning something hidden or difficult to read. The emergence of informatics and the mass use of digital technologies have raised a growing number of security and privacy concerns, making encryption a major issue for protection, be it in personal or national issues. Whereas criptologists study secret writings and biologists study living entities’ strategies, French philosopher Roger Caillois has a unique view of crypsis. By dissecting the stomachs of birds he proved that crypsis is not really working as a defense strategy. The birds’ stomachs were filled with equal numbers of camouflaged and uncamouflaged insects. What then drives these animals to imitate their surroundings so remarkably? Caillois posits the idea that crypsis stems from a mythological desire for dissolution into the world. Wouldn’t then our use of language, form, movement, or sound also be a drive to dissolve ourselves into the world? A means of surrender and belonging? A personal dissolution into the geometry of affects? 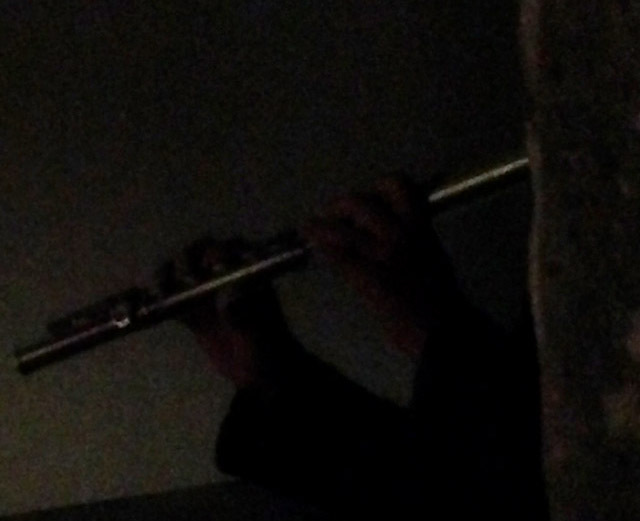 In the performance SONIC CRIPSIS, a flutist transposes a secret soundtrack for the flute, simultaneously encrypting its content and merging into the surrounding sonic space.